A beautiful tic-tac-toe goal. Johnson from right wing to Hughes in the center to Freytag on the left, who pushed the puck into the open net. This game will just about end with a power play for OSU. Hughes sent off for tripping. 2:05 left. UW 2, OSU 0, 2:05 left/3rd. Buckeyes going on the power play after a tripping call. OSU may go 6-on-4 for the duration. 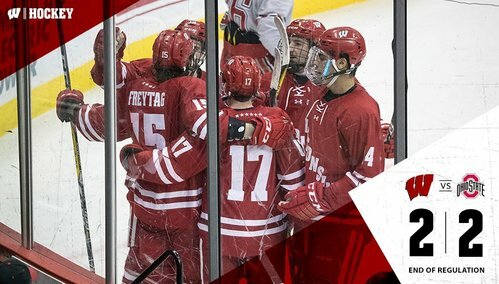 Badgers take a penalty with 2:05 to go but they lead 2-0. They do go 6-on-4 immediately. Jurusik dives to cover a loose puck in the crease. Buckeyes pull their goalie to have a 6-on-4 advantage. OSU scores with 1:40 left, which is just what the doc ordered for the Buckeyes. Goal to Ohio State with 1:40 left. Jobst scores as the Buckeyes cut their deficit to 2-1. Well now. Buckeyes score with 1:40 remaining. Jobst through traffic, I think. OSU takes a timeout. 2-1 Badgers. #UWvOSU . OSU scores on the power play to make it 2-1 with 1:40 to go. Mason Jobst scored the goal. He's been OSU's best player all night long. Goal was a long-time coming. Overhead angle made it look like Mason Jobst's shot hit off Dakota Joshua in front. Either way, UW's lead is cut to 2-1 with 1:40 left. Goalie is pulled. Faceoff coming in the Bucks offensive zone. OSU pulls their goalie again with under 1:30 to play. Kunin misses an empty-net backhand wide left. Wagner ices the puck, although it was a smart play, 21.9 left. Ohio State ties it with 16 seconds left. Holy cow. Tip-in goal for OSU with just under 20 left. Unbelievable. UW ices the puck with 21.9 seconds to go. Faceoff coming in the defensive zone. Goal!! Buckeyes tie the game with 16 seconds left! Super Saturday. Two overtime games in the Garden. Does it get any better than this? So, two overtime games for the #Badgers today at MSG. Basketball team rallies late, hockey team wastes two-goal lead. So, not quite a Badgers sweep yet. Huh. SOG: UW 32, OSU 29. 2-2 and headed to overtime. #Badgers fans in NYC certainly getting their money's worth today. 3:23 left in OT. One good chance for UW thus far. Jurusik seriously almost put one in his own net off his stick, but snagged it out of the air with his glove. 2:07 to go in OT. Frey makes an easy save. Faceoff in OSU zone. 2:21 left in the five-minute overtime. Chances for both teams so far. Goal for the #Badgers , who beat Ohio State 3-2. Cameron Hughes with the winner. Hughes wins it for the Badgers. Stuffs a loose puck home. Wisconsin wins two overtime games in the world's most famous arena. Wow. They are reviewing the goal. Question of goaltender interference on what would be an OT winner for the Badgers. FWIW, I immediately thought it was goalie interference and @E_Levy3 thinks it might be too. Badgers appear to win the game. Play is under review. 2:02 left in OT.